Click on each image to visit the different stages of this Jigsaw series of work. 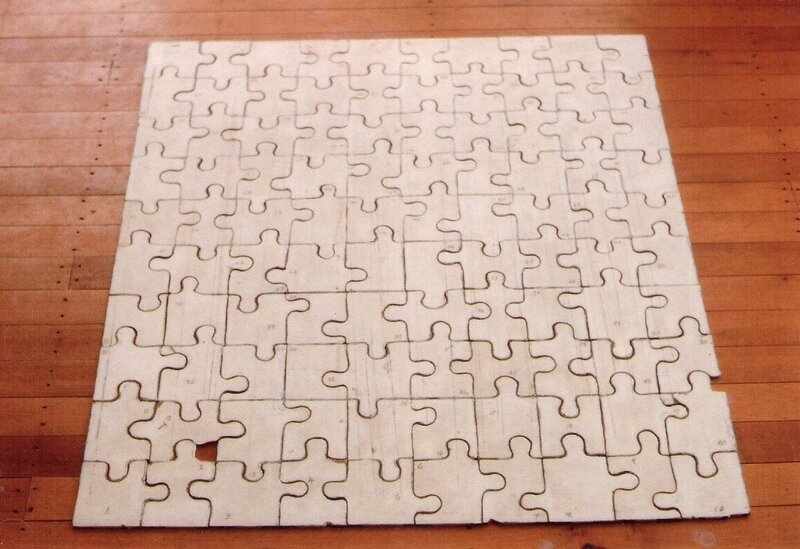 1, The original Jigsaw was hand cut from an old used sheet of plywood. 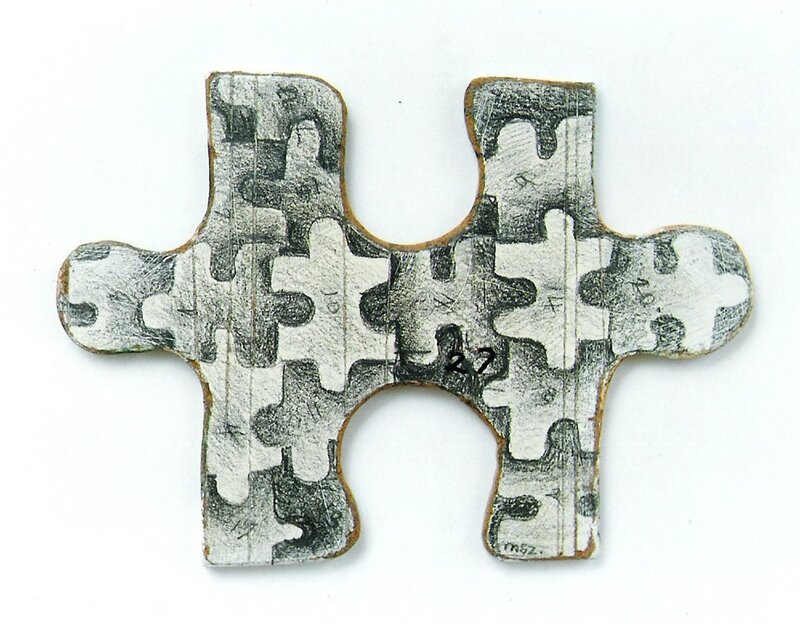 Each piece of the 100-piece jigsaw was numbered on the front white face and signed on the reverse side, which was painted with a clear medium and scratched into. The work also had an image painted on the edges of half the pile of jigsaws when stacked and I recorded a projected image onto the other half, presenting it as there and not there. 2. I made up a contact list of family, friends, artists, gallery owners and arts writers. Wrote an accompanying letter and sent each jigsaw piece out to these 100 people. I asked them to do anything they wanted on the piece in response to the question - What is between? 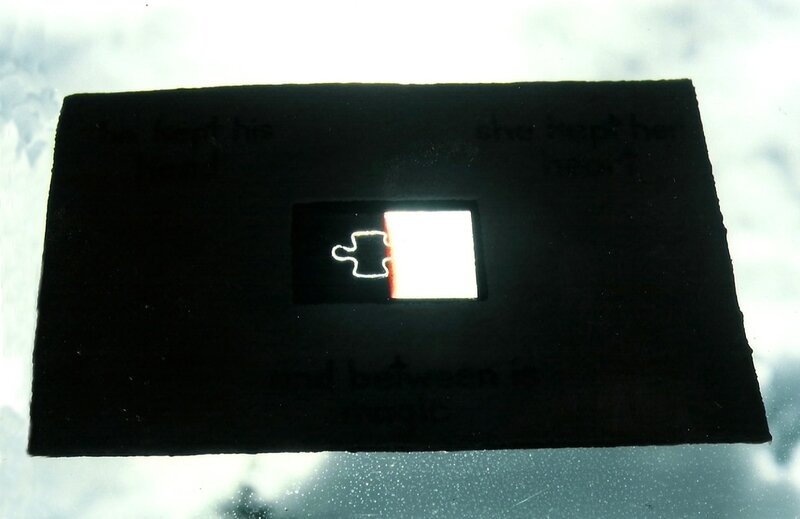 And asked them to send it back to me, in the hope the jigsaw would once again be reformed and exhibited as such. Of the 100 pieces, 28 came back. These pieces were exhibited at the Manukau School of Visual Arts graduation exhibition and then in the office of the Fisher Gallery (aka - Te Tuhi Centre for the Arts) the following year. 3. At the same time as the wooden work was being sent out to the 100 recipients, I made a separate one-off work which was sent to (now deceased) John Glenn the American Astronaut at NASA. At the time he was preparing to circumnavigate Earth. In an accompanying letter I asked him if he could take my small work (I had enclosed) into space with him and let it go. Where there are no limits. Please click on each images above to see these four stages of this work.